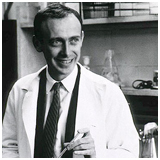 James Dewey Watson KBE (1951), born 6 April 1928, is a molecular biologist and Nobel laureate, best known as one of the co-discoverers of the double-helix structure of DNA. After gaining his PhD in Zoology at Indiana University, he spent a year at Copenhagen University before moving to Clare College Cambridge in 1951 for post-doctoral research. Together with Francis Crick, he proceeded to deduce the double helix structure of DNA. The announcement of the breakthrough – hailed as the most important scientific discovery of the twentieth century – was made in April 1953. James shared the 1962 Nobel Prize in Physiology with Crick and Wilkins for their research on the structure of nucleic acids. At Harvard University, from 1956 to 1976, Watson championed the emerging discipline of molecular biology. In 1968, he became the Director of the Cold Spring Harbor Laboratory, later serving as its Chancellor. There he created a pre-eminent research environment for the study of genetics and oncology. Between 1988 and 1992, he was associated with the National Institutes of Health, helping to establish the Human Genome Project. He was elected to an Honorary Fellowship of Clare College in 1967 and in the 2002 New Year’s Honours received an honorary KBE for services to the UK-American partnership in genetics and science.